Last week was a very bad week for me and baby A, it was Friday afternoon and he started showing signs of fever, his fever spike up to 104 F that night, we brought him to his pediatrician first thing Saturday morning, apparently my poor baby had ear throat double infections, no wonder he refused food and nursing completely. Worrying that he will be dehydrated I had to forcefully give him liquid, he swallowed with great difficulty and lots of tears. To cut the story short, it was 5 days and nights of no sleep and lots of tears for both mommy and baby. When he finally nursed after 5 whole days of nursing strike... I sigh with relief and promise to myself that I will never complain about his night time marathon nursing again! So today after sending the baby to the daycare, I decided that I want something that could comfort me and compensate the harsh week I had! 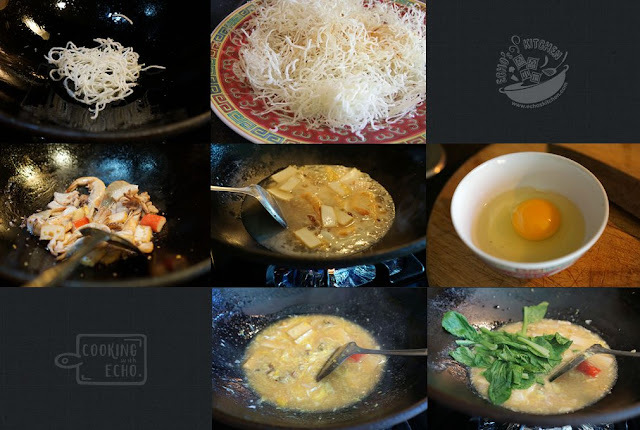 I set out to make this crispy rice noodle. There is this restaurant near my parent's house that made the best crispy rice noodle ever. I tried to make this as close to the one they made back home as possible. This recipe tastes slightly different than the one I liked, but not bad as a home cook version, not bad at all. 1. Heat up about 1 cup of oil, deep fry the rice noodle in small batches until crisp and fluffy. (DO NOT soak or wash the rice noodle, use it right off the packet). Place the rice noodle in plates that you will serve the noodle. 2. Leave about 1 tbsp of oil in the cooking pan, stir in minced garlic and cook until fragrant. 3. Add all the seafood and cook until changes color, add the chicken stock and season with fish sauce and salt, bring the gravy to boil. 4. Add Chinese mustard and thicken the gravy with starch water, as the gravy boiling, give it a quick stir while you drip the lightly beaten egg into the wok, it will form egg drops. 5. 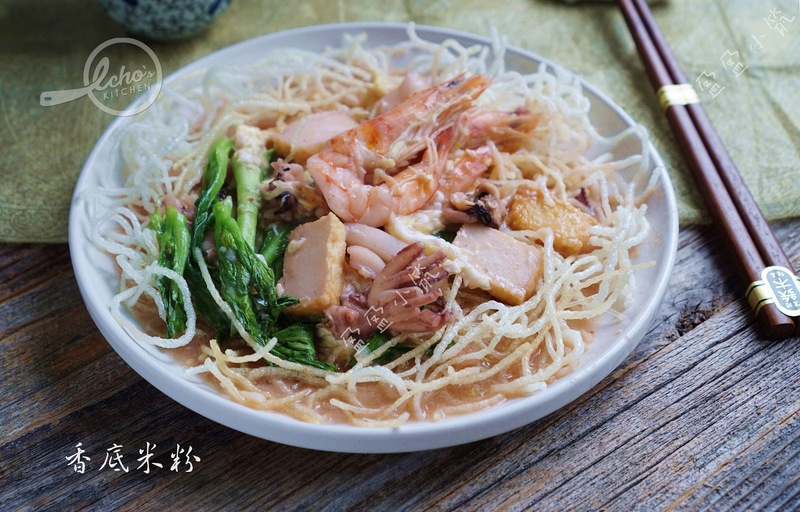 Add a few drops of sesame oil and some white pepper powder, pour the whole gravy with seafood onto the crispy rice noodle. 6. Serve with some garlic and chili in soy sauce.